Tony is presently a Senior Consultant to WCRE | CORFAC International, providing strategic advice on company growth and relationships in southeastern Pennsylvania. 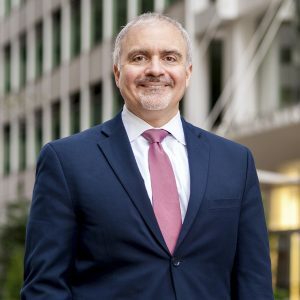 Tony joined WCRE in October 2015 as Vice President of Corporate Strategies, and served as WCRE’s Chief Operating Officer from May 2017 to December 2018. With more than twenty years’ experience in the legal and political arenas, he brings a unique, multidisciplinary perspective and deep understanding of the issues and people key to the real estate landscape in the region. He has been actively involved in many civic institutions in Philadelphia, from community associations to advocacy non-profits, and has built trusted relationships with government and private sector leaders in both Harrisburg and Philadelphia. As a legislative chief of staff, Tony successfully established offices and assembled staffing teams for members of the Pennsylvania General Assembly in both Delaware County and Philadelphia. He helped shape and execute legislative policy, communications, and community outreach, while working closely with business leaders, community stakeholders, and government officials. Attorney | Hamburg & Golden P.C. Attorney | Kent & McBride P.C. Prior to his public service, Tony was an attorney in the private sector for more than a decade. His practice involved commercial litigation and property subrogation matters in multiple jurisdictions for results-oriented institutional clients.